This project details a History of the Faith in Ransboro from ancient times. It was compiled by 6th Class 1999/2000 as part of their preparation for the Sacrament of Confirmation on May 19th, 2000. Coolera, the remote angle, is the ancient name of this district. It is not applied to any particular area of land but the people of Sligo popularly know the name. It is comprised of the area between Sligo, Ballisodare Bay and Loch Gill containing the parishes of St. John’s, Kilaspugbrone and Kilmacowen. Nowadays it contains the parishes of Ransboro and Strandhill. Coolera is an area steeped in history. The first mention of Sligo, which we find in the regular history of the country, occurs in the Annals of the Four Masters, under the year 537 A.D and in the Annals of Tighernach under the year 543 A.D. The entry opens with “The Battle of Sligo” and Sligo here means the river of Sligo. The extraordinary sepulchral monuments of Carrowmore are thought to be connected with this battle. One tradition has it that the battle was fought between the Firbolgs and Tuatha De Danaan. A later tradition indicates that the battle was fought between the men of Ulster and the men of Connacht, and that the monuments were raised to those fallen in battle. Coming to the Christians we find that the area was divided into three parishes – St. Johns, Kilmacowen and Killaspugbrone. Killaspugbrone came first in order of time. St. Patrick, who put his disciple Bronus in charge, from whom it gets its name, Killaspugbrone – the church of Bishop Brone, founded the church. Two references are found in the Four Masters to Killaspugbrone: one under the year 511 A.D, which states that St. Bronus, Bishop of Collera, died on the 8th of June. The second reference is under the year 1306, stating that Peter O`Tuathalain, Vicar of Killaspugbrone, died. From a list of parish priests registered in 1704 we know that Father John Dugan was the parish priest of Killaspugbrone. That is all that history holds regarding the rulers of the church then. Kilmacowen the Church of the Sons of Owen is so called from the sons of Owen, a Munster chieftain. Two of the sons came to Connaught. This parish stretched Ballydrehid to Seafield, and from Kellystown to Barnasragh. It is not clear how long this area remained as part of a religious endowment probably not later than the middle of the thirteenth century. In 1239 we find the daughter of Cathal Crovderg O’Connor had it as part of her dowry. 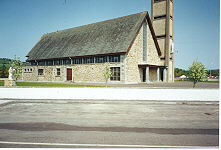 She gave it as an offering in honour of the Blessed Trinity and Our Lady to the canons of Trinity Island in Lough Key. The last parish priests of Kilmacowen of whom there is record were Reverend John Duggan, who resided at Kilmacowen and was Parish Priest both of Kilmacowen and Killaspugbrone, and Reverend John Mc Donagh, living in 1712, who was Parish Priest of the same parishes after Father Dugan. The two churches were no doubt in ruins in those days. Father Dugan and Father Mc Donagh were obliged, like most priests of the day to celebrate Mass and confer the Sacrament in the open air. It seems probable that they said Mass at a rock at the back of the present old church of Ransboro. This was where priest and people assembled in those penal days. It was selected, no doubt, because of its extensive view all round and so enable those on watch to see the priest hunters while they were still a long way off. The location indicates the secrecy and fear with which persecuted people and hunted priests gathered to worship God. Tradition has it that during Mass a wren invariably came out of a crevice in the rock and remained near the Altar until Mass was finished. From that tradition came the name “Wrensborough” or “Wrensboro” but now known as Ransboro. There is no townland as such just an old church with its centuries of hopeful prayer.